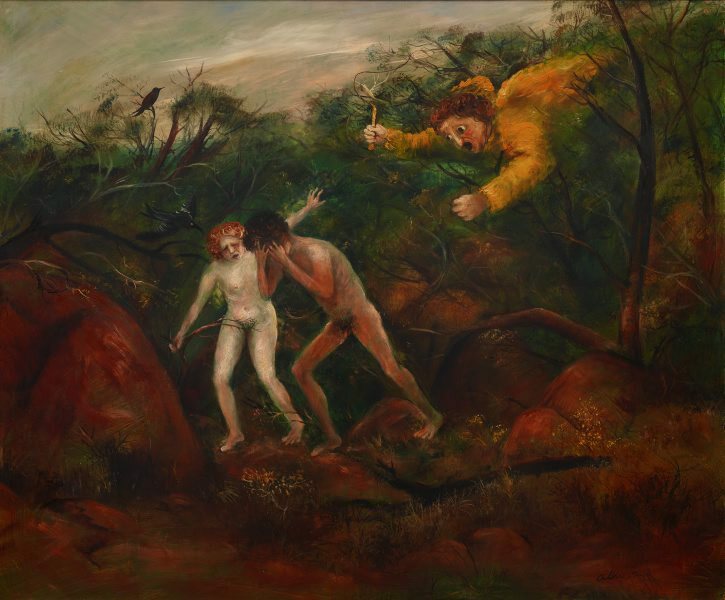 'The expulsion' completes Arthur Boyd’s cycle of biblical-themed paintings which he began in 1944. 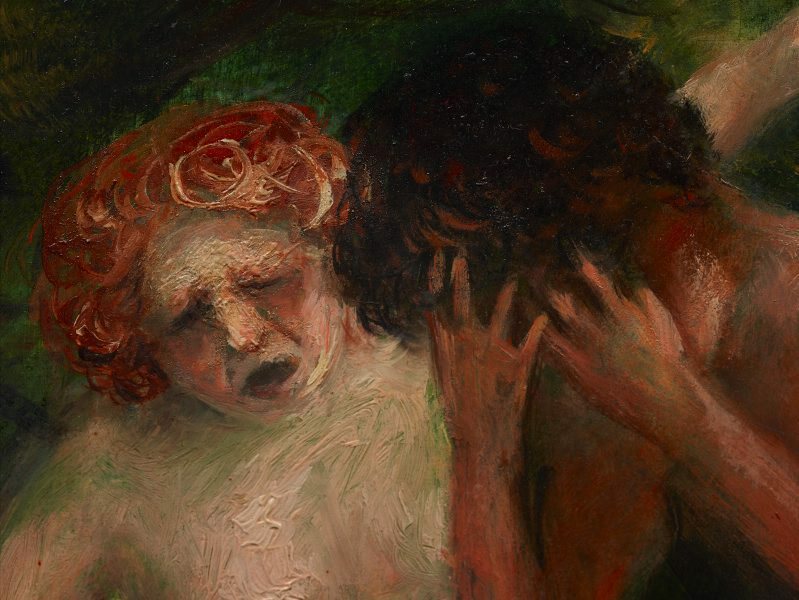 Based on the Old Testament story of Adam and Eve expelled by God from the Garden of Eden, the figures recall the work of 15th-century Florentine painter, Masaccio. 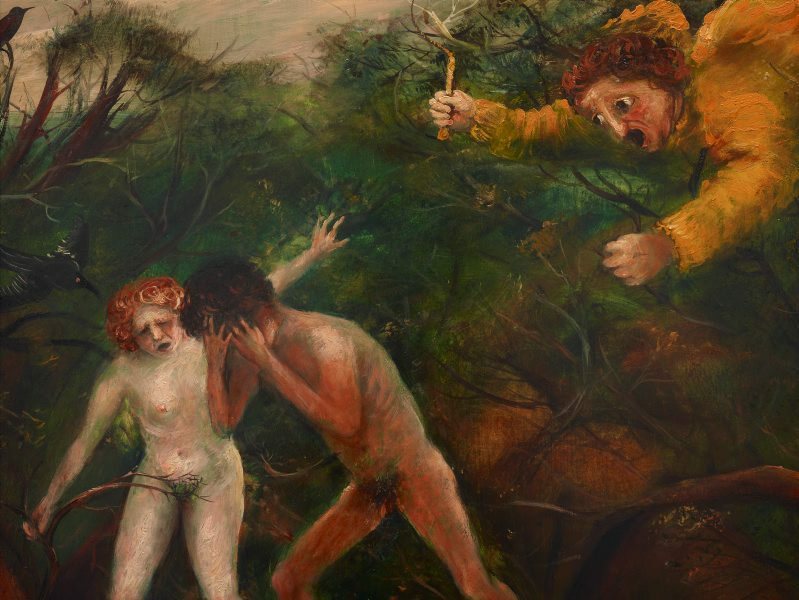 Boyd transposes this early Renaissance pictorial idea into an Australian wilderness. 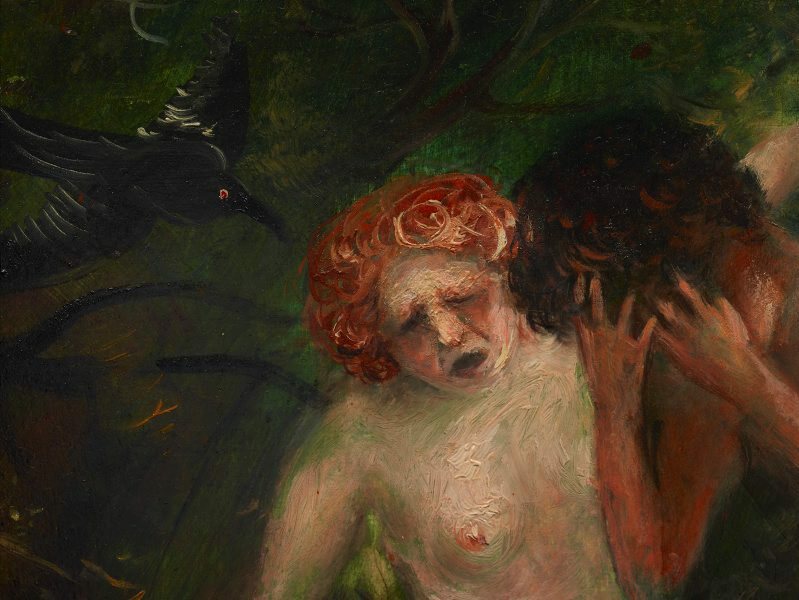 The focus of 'The expulsion' is not so much the biblical narrative as a poignant depiction of Boyd’s concern for lovers denied privacy, which he had experienced when courting his future wife, Yvonne, after his conscription into the army. 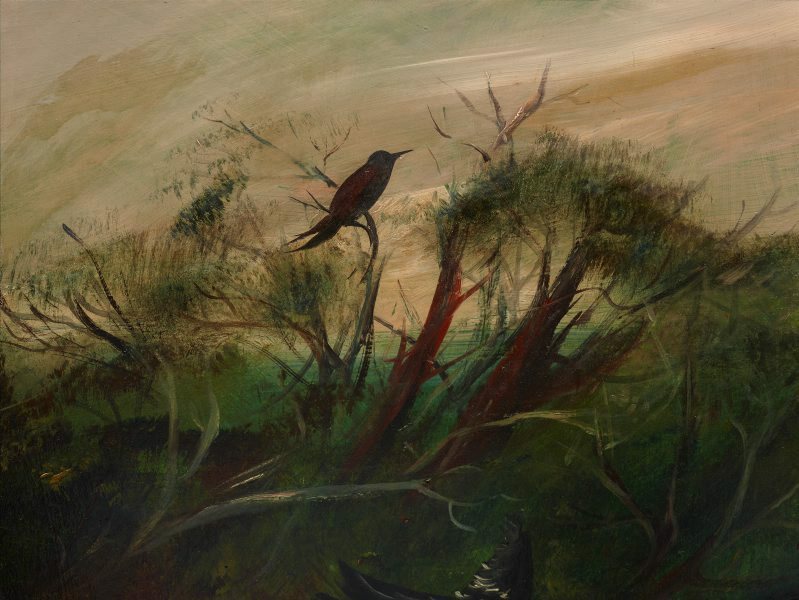 Lou Klepac, Australian painters of the twentieth century , 'Sidney Nolan', pg. 136-147, Sydney, 2000, 150 (colour illus.). Jill Sykes, Look , ‘Barry Pearce’s next book-call it “segueing with intent”’, pg. 28-29, Sydney, Mar 2012, 28. Jill Sykes, Look , 'Small and temporary: but it's a big pointer to the future', pg. 28-29, Sydney, Sep 2011, 29 (colour illus.). 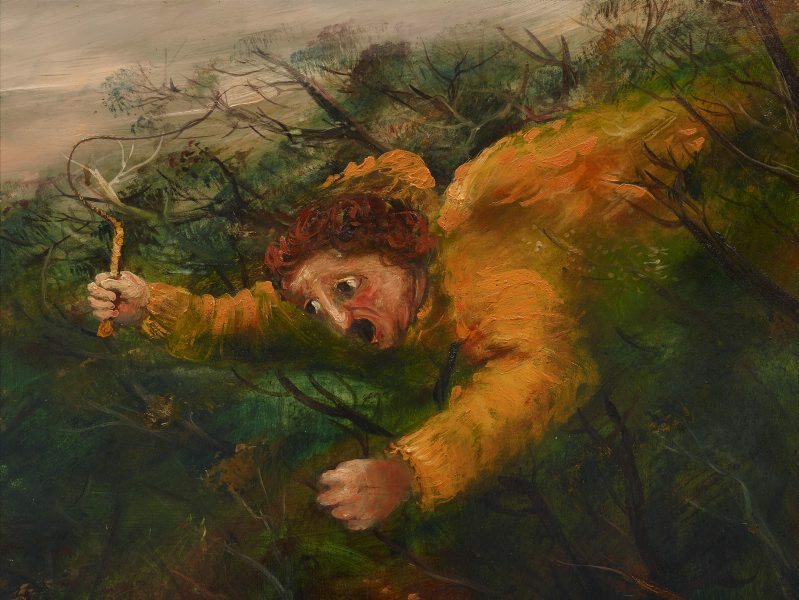 Natalie Wilson, Australian art: in the Art Gallery of New South Wales , 'Out of Melbourne: realisms and mythologies', pg. 163-164, Sydney, 2000, 164, 173 (colour illus. ), 300. Look , 'About a Boyd', pg. 7, Sydney, Jun 2002, 7. 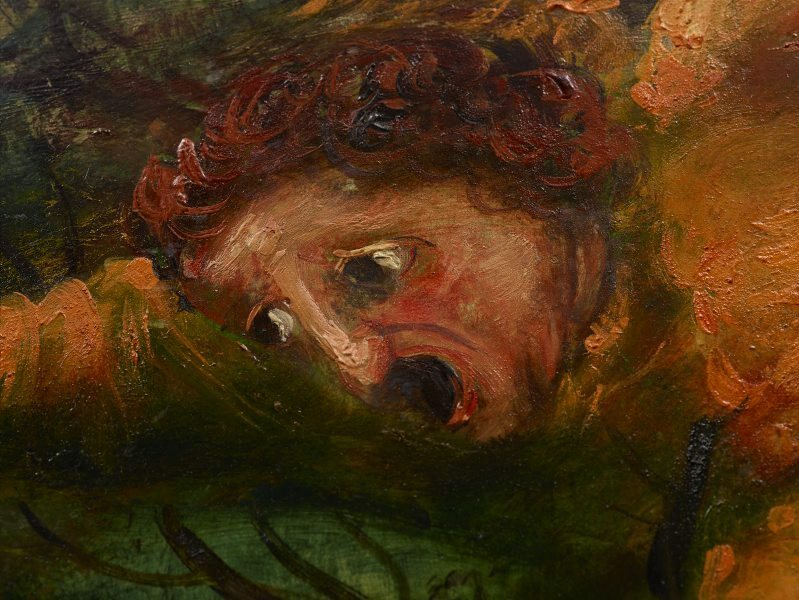 Article with photograph of Tom Rosenthal standing in front of the painting. 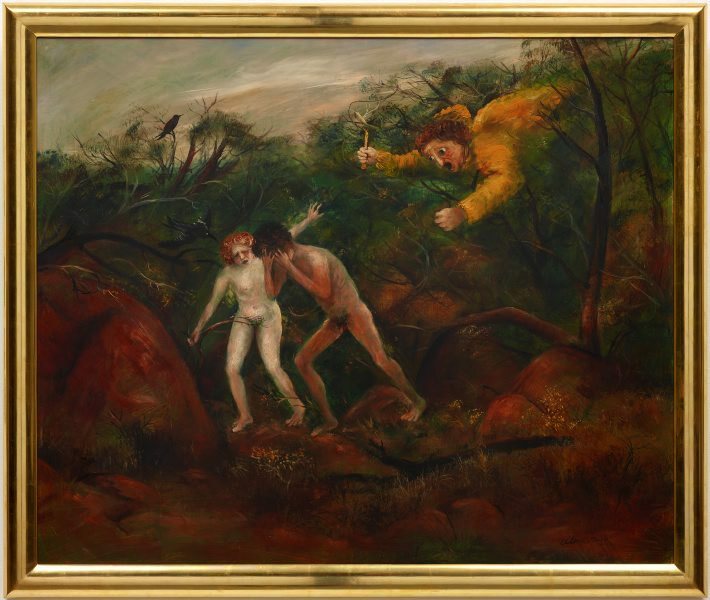 Rosenthal owned this work until he sold it to the AGNSW in 1986. Authority and influence: Australian literary criticism 1950-2000 , St. Lucia, 2001, front cover (colour illus.). 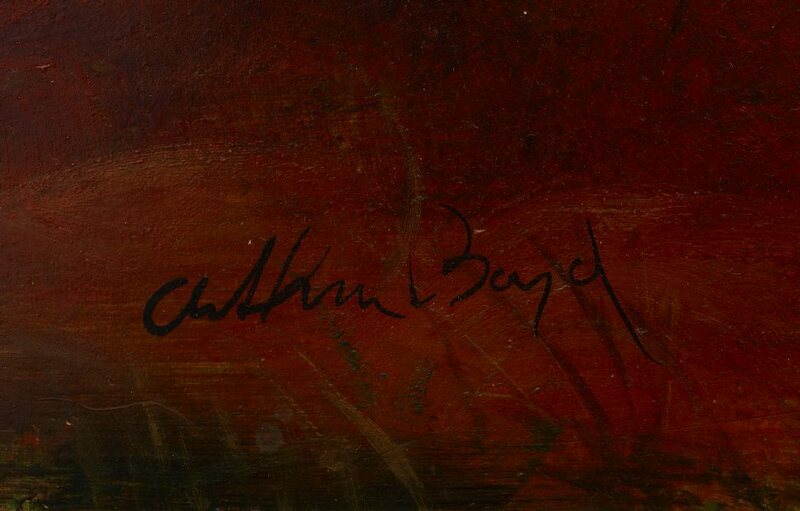 Arthur Boyd: Art and life , London, 2000, 74, 75 (colour illus. ), 76. Heavenly creatures , Bulleen, 2004, 5, 18 (colour illus. ), 30. Art Gallery of New South Wales handbook , Sydney, 1999, 154 (colour illus.). Artwise: visual arts 7-10 , Milton, 2004, 154 (colour illus.). Art Wise - Visual Arts years 7-10 , Queensland, 1997, 21, 34, 52, 118, 122, 126, 129, 146, 148. AGNSW Collections , 'From Colonialism to late Modernism', pg. 7-106, Sydney, 1994, 54 (colour illus.). Art and Australia (Vol. 24, No. 3) , Sydney, Autumn 1987, 325 (colour illus.). Five years on: a selection of acquisitions 1981-1986 , Sydney, 1986, (illus.). Australian Painting Today , London, 1963, 62 (colour illus.). Religion and literature , Indiana, Spring 2007, front cover (colour illus.). Dynasties: the Boyd family , Sydney, 2003, (colour illus.). This episode of 'Dynasties' was first screened on ABC television on 23 November 2003 at 8:00pm.